I am not a big soda drinker, but I love sparkling water with lime. Most of the time, I never finish the entire 2-liter bottle before it goes flat. And, Mr. Serious will drink an entire 2-liter soda in two days so it doesn’t go flat on him. 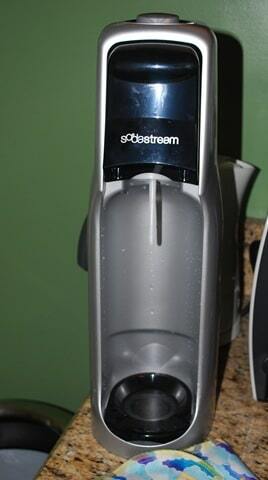 Sodastream recently introduced us to their FountainJet. To say that we are enamored with it would be quite the understatement. The FountainJet starter kit comes with two 1-liter, BPA free, reusable carbonating bottles, the machine and one carbon dioxide canister. We’ve been using it about a month and haven’t yet run out of the gas. It’s so easy to use, too. No plugs, no batteries. Just fill the bottle with water, screw it onto the machine and push the button on top three times. 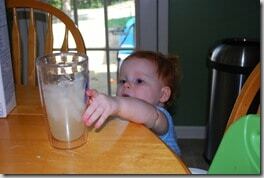 Then you unscrew the bottle, and either add flavoring, or drink the freshly bubbled sparkling water. There are such a variety of flavors, too, from regular cola flavors (like lemon-lime and rootbeer) to orange-mango and lemonade (two of our favorites). Each SodaMix makes approximately 12-liters of soda depending on the flavor amount you use. One thing that was a pleasant surprise is that they don’t use high fructose corn syrup to sweeten their SodaMixes. And, yet, the sodas contain 2/3rds to 1/2 as much sugar and calories as regular sodas. The caffeine is also lower, too. 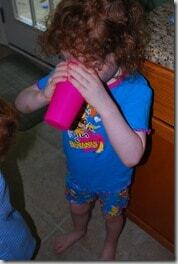 Our girls never had soda before the FountainJet, and while we still don’t let them have a lot, because there is less sugar in it then their juice, we are okay with them having it every once and a while (none of the caffeinated ones, however). We weren’t fans of the diet flavors. There is something about the taste of Splenda (sucralose) that I don’t care for. The flavor of the drink is okay, but immediately following it, is a terrible after-taste. This is true for me for all Splenda drinks. If you aren’t sensitive to it, I have a feeling it won’t bother you at all. You can buy the FountainJet starter kit for $99.95 through their online store or you can buy the FountainJet through Amazon. We would definitely buy this again, and are already figuring out when we will need to budget to buy more carbon dioxide canisters so we don’t run out. I freakin’ love that machine and my son loves it even more. Unlike you though, I’m all about the diet flavors, just the diet flavors. This reminds me that I had it all put away while the house was up for sale. Now I can get it out until my son leaves for school in a couple weeks. He likes it so much he asked to take it with him to college, no joke! PS. Business cards were FABULOUS! Thank you so much! I’ve seen the SodaStream Machines on occassion, though have never tried their soda. I am intrigued by the fact that they don’t use high fructose corn syrup in their mixes – so much tastier. Perhaps it would be worth a try. Thanks for your review!